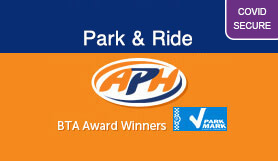 APH Manchester is an off airport car park which is located only 5 minutes from the airport. The car park offers efficient transfers which run 24 hours a day. Assistance is available on request for passengers to help load luggage and off the coaches. Assistance is available for disabled drivers and passengers. Please contact our Call Centre for more information. Assistance is available for disabled drivers and passengers. Please contact our Call Centre for more information. Maximum vehicle height limit of 2.4 metres or 7 1/2 feet at this car park. Full instructions for returns procedure will be issued on arrival at the car park. Exit J5 then exit at 2nd junc signed A560. At r'bout turn left signed Sharston. Straight at next R'bout & left at next R'bout into Sharston Ind. Estate Take 1st left and Car Park is on the right. Exit J4 onto M56. Exit at J2 signed Wythenshawe, go right at R'bout into Sharston Ind. Est. Take 1st left and Car Park is on the right. Join M56 & exit at J3A signed A560. Turn right onto A560 & go straight over next R'about. Left at nextR'about into Sharston Ind. Estate. Take 1st left and APH is on the right.